Another week and another hole-in-the-wall Mexican joint. It’s actually been awhile since we have reviewed a Mexican restaurant, so it worked out that Steph and I both had the hunger for south of the border fare. Garcia’s is a real small place located on Market, just south of 21st St. Luckily they had a nice yellow sign outside to draw your attention to what is mostly a stretch of run down buildings along the east side of the street. Inside you will find a small, clean dining area with perhaps 8 tables available. The staff is small, consisting of two waitresses and one cook, but very friendly. Since it was our first time at Garcia’s our server offered several suggestions to us. The menu at Garcia’s is small, so small that it is actually just displayed on the wall. And just in case you are easily confused with Mexican cuisine several cartoonish-like pictures accompany the menu mural. What tasty selections are plastered on the wall you ask? Well, there are tacos of course, tostadas, burritos, enchiladas, tortas, as well as menudo soup. With each menu item you have your choice of several meats including carne asada, barbacoa, chicken, and pork. Chips and salsa were quickly placed on our table as we mulled over the menu board. The chips were fresh and warm and both salsas were good. The red salsa was the milder of the two and had a rather unique taste. It was pureed and had a vinegar taste to it. Although different from most salsas, we both liked it. The second salsa had a bit more kick to it and featured tomatillos and cilantro. Steph decided to go with a basic carne asada taco meal and I went with the torta meal with pork. With only a few other patrons in the restaurant our food came out very quickly. My torta was large with plenty of pork and lettuce inside. 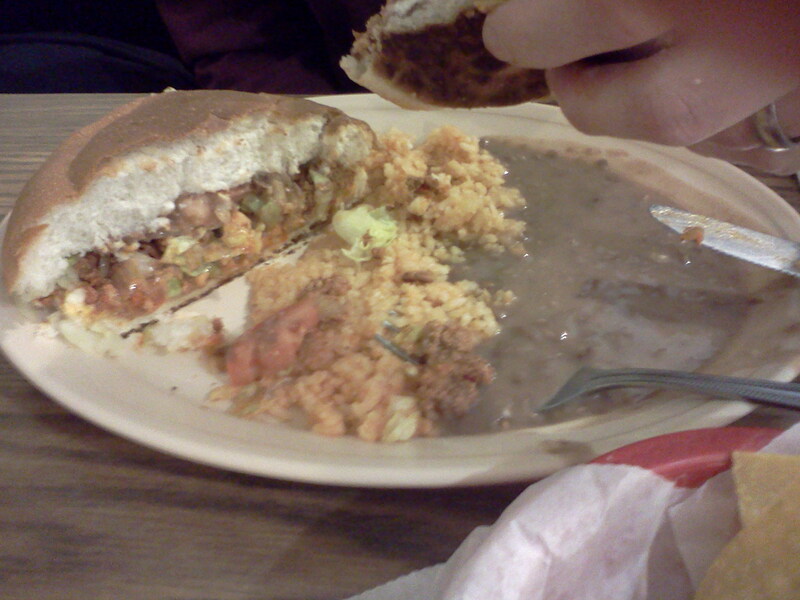 Although I would have liked a little cheese on my torta, the abundance of delicious pork made me very happy. Steph’s tacos were of the authentic variety and consisted of flat corn tortillas with carne asada, lettuce, and tomatoes. Notice that they were not smothered in cheese like many places like to do. Both of us enjoyed these simple yet satisfying tacos. Our dishes were also served with ample portions of beans and rice which were good as well. So what could top off this great lunch you ask? How about the fact that it only cost us about $14 and both of us left stuffed. 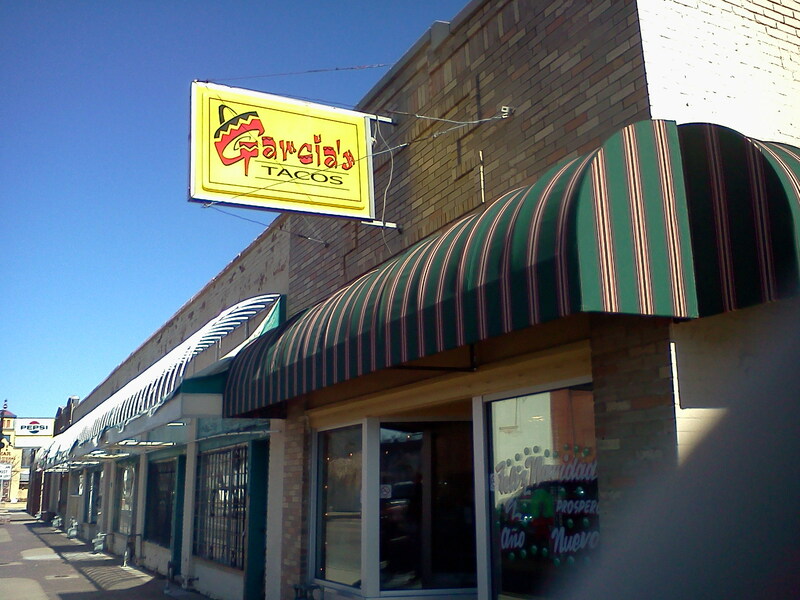 Garcia’s is a friendly place where one can come to enjoy a simple and cheap good eat. Unfortunately Garcia’s has limited hours and is only open till 3 pm daily. But that still gives you plenty of time to drop by for an enjoyable lunch off the beaten path. I’ve never heard of a torta! OK, I have but didn’t know what it was. Is it sort of like a meat pie? And what is barbacoa? Thanks for another great review! A torta is like the mexican version of a sub sandwich. It has a hamburger-esque bun and then is typically filled with meat, veggies, cheese, guac, etc. Many traditional Mexican places around town offer tortas (even Felipes). Barbacoa is typically beef that has been slow cooked until very tender and then shredded and mixed with spices and such. Again there are many places around town that you can find it at. Thanks for all your comments on our blog! a torta is a Mexican sandwich; like the word “tort” it means layered. “Barbacoa” is the “spanglish” word for BBQ. Did you know there’s a typo in this title?